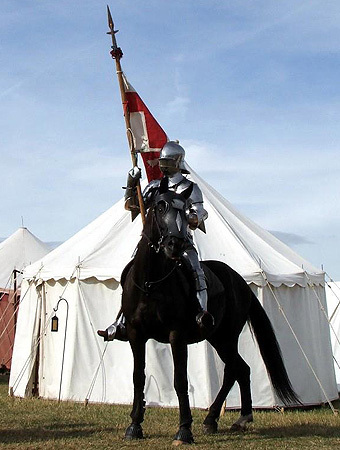 Contrary to popular belief, the medieval knight was not mounted on a huge plodding draft horse like the famous Shire. By combining archaeological finds with pictorial evidence we can paint a picture of the typical Destrier as a very athletic short-backed horse not exceeding 15.2 hands in size. Medieval paintings often show horses in perfect collection with beautiful gaits, permitting the conclusion that the medieval warhorse was highly trained and extremely manoeuvrable. 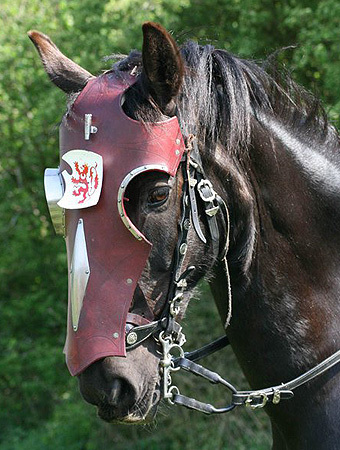 Working with the UK's leading suppliers of stunt and re-enactment horses, we attempt to recreate the image of the medieval Destrier by using a large variety of different breeds. 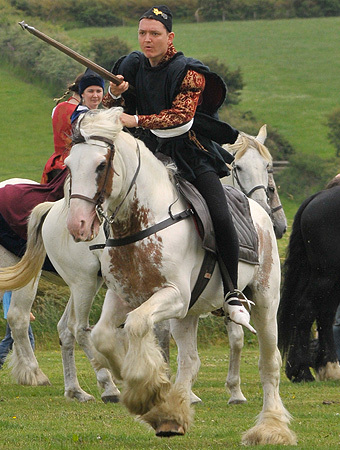 Destrier members constantly train, expanding the skills of horse and rider to meet the challenges of medieval mounted warfare. 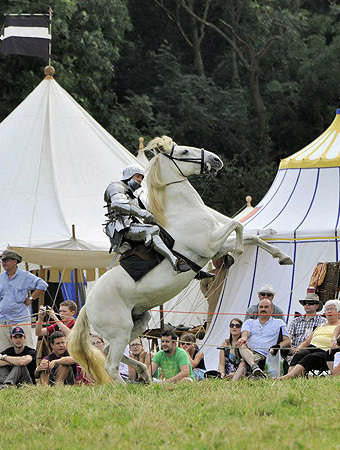 Riding a spirited horse in real armour, wielding a variety of medieval weapons on horseback, and controlling the horse safely and effectively in combat, are the core skills of every Destrier rider. Of course our horsemen are more than happy to share their knowledge of the medieval warhorse with an interested public, be it questions about breeding, training or use.